Janelle Monáe dropped a new album, Dirty Computer, this week, and with it a visual accompaniment she’s calling an “Emotion Picture”. In a memory flashback within the film, Monáe’s Jane 57821 drives [flies?] this early 1970s Ford Mustang-shaped flying car, and it’s just too cool. The car is a major part of the stand-alone segment for the song “Crazy, Classic, Life”. As with her previous albums, she plays the part of an android protagonist that is fed up with being treated as less than human, playing with themes of racism, sexism, and discrimination. From the janky beltline upward, it’s pure Mustang, but the bottom of the car has been remade as a complete slab, replacing the wheel openings with painted bodywork. We were promised flying cars. When do I get my flying car? 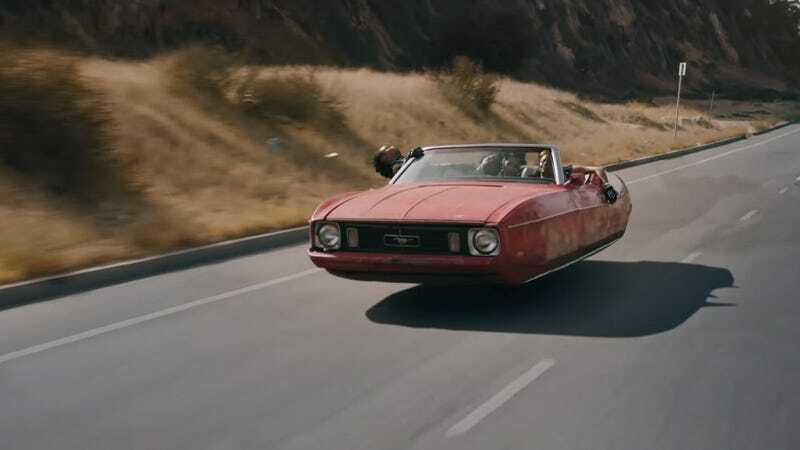 I want a flying car conversion on a 1972 Mustang Convertible right now. I want a Crazy, Classic, Car.